One of the things that comes up every now and again is search engine optimization (SEO) but people don’t talk about it so much anymore because it changes. Search engine optimization (by the way I am going to refer as SEO for the rest, to save time), it changes and in effect its Google’s win. So Google wants its search engine results to be clean and fair and for the good of the good. It doesn’t want people spamming it, it doesn’t want people black hatting to get to the top artificially. It doesn’t want to be full of results for Viagra and for results of pages with no information. Just copy everyone else. It wants genuine information because its customers are people that search. If people don’t find what they want on google, they’ll go and use Bing. Google wants to have the best experience so it does its best. So for us, marketing, if we’ve got a website, we want people to find out our content and wouldn’t it be fantastic if we could just be number 1 in google. When anyone searches for any term, if we came up at the top, well that’s unlikely to happen. But there are some things you can do. So the way you setup your page that’s going to help and that hasn’t really changed. Now if you follow our advice, you will use a WordPress website. You’ll be in control, it will not be the free version of WordPress. Although, oh let me explain. Not the free hosted version that WordPress hosts themselves at wordpress.com. Not that one. WordPress is still free to download but then you pay for a hosting company and you are in control of your own. do not use the free one, do not use blogger.com, please. I am not going to explain it today. Just don’t. So use WordPress and then you can use plugins. You can use plugins such as Yoast SEO, Platinum SEO, All In One SEO and these things set the site up perfectly. But on a webpage, you need to craft a good title. The title should have a keyword in it. The keyword for the page. You need to include that keyword in the first couple of paragraphs of your writing. Maybe a couple of times in, you know naturally. And then if you write correctly, you are going to mention the keyword in passing or related keywords. Google’s robots are incredibly smart. Almost artificial intelligence smart. They know when they are related terms. For instance — you could be writing about cars — but which kind of cars? Are we talking Cars the band, Cars the movie, new cars, used cars, toy cars — which one? Google will know because it can understand the writing. It’s hard to explain but they can. So there’s no need to write just the word cars, cars, cars, cars. They know. They know that the vehicle is a car. They’ll know that Pixar means that. They’ll know that automotive or auto is related to cars. They know what these things mean. It’s just clever. I would recommend having the keyword at the end of the last paragraph of the page as well. In addition you need to have that keyword in your, what’s called the Meta tittle. You can figure out what that is. You should put it in your Meta description. However the search engines don’t really take a lot of notice. But that description is what is going to come up in the search engines. So your reader will see it and it generally is highlighted, bold if that is the keyword they have entered, very important. And the same in your Meta title that comes up there as well. If you have images, it’s best to have to use the keywords somehow in the Alt tag of the image. It’s also a good idea to use it in the filename of the image. It’s also a good idea to use the keyword in, what’s called the URL slug of the webpage. Again if you are doing this on WordPress, then you’ll figure it out. If you want to know how to do it, if you want to learn, if you want to change your website to be WordPress, if you want to setup a website in WordPress, we have a course. It is at www.website101.co. You can follow it through. You don’t have to be a techy in anyway. My mum could do this. It is click by click. Every single clip and step to set it up and to make a website that not only is good for SEO but is good for capturing leads, and working the system. 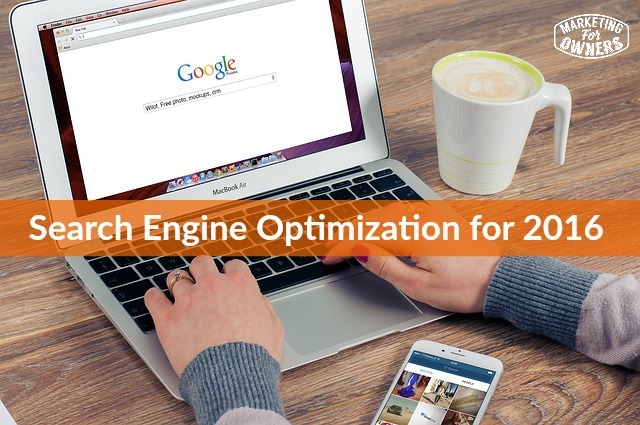 The other way of SEO in 2016 is just to simply forget SEO. Beyond that you need links. You need other sites and other people to link to you, but forget about it in SEO terms. Think of it in, as I explained on Tuesday, as leveraging important people’s audiences. So what you can do is create fantastic content. Now I don’t mean just write an article that you think is good. I mean create something really good. A massive resource, a guide, a consumer guide, a be all and end all. Every single piece of information you know something about. For instance if you are explaining how the best way to groom your dog, how about the consumer’s guide to dog grooming? Everything –what to do, what not to do. What tools to use, what not to use. What to look out for, how to do big dogs, how to do small dogs, how to do long hair, how to do short hair? Resources, charities, everything. Then once you have written this and don’t be self-promotional, this is going to be on your own website. It’s kind of inferred who you are and that you are an expert. You can put a little link at the end. But don’t say we do this, because other people won’t cheer so much. Then contact people who are big in your space. Journalists, pet magazines, dog magazines, pet stores, dog stores, dog charities, dog websites, pet websites. Yeah, you get the gist. Yeah and contact them. Find the email address of the person. Write a very simple email and say, ‘Hey, I see…’ Check that by the way, before you do, check their blog and make sure they do share stuff like this. Say, ‘I see your website, or your paper, or your magazine about the things and I’ve been reading it and I love it. And especially the article you wrote on so and so, so and so.’ Quote something that is specific to their site, put some effort into this. And then say, ‘I write about similar things and noticing that you cover dog grooming. We’ve put together what we think is possibly the biggest resource, and the most comprehensive resource on dog grooming, ever. We thought maybe you may be interested to see what you think. So don’t give them the link because this will be surprising. They have the opportunity to answer and say, ‘Yeah, sure. Send it over.’ Then you know they’re going to look. Then you can send it and say, ‘Please let me know what you think.’ That is miles better. The second option is to simply send them the link if they are not the mega important ones. Send them the link and say, ‘Just love to know what you think.’ Don’t ask them to do anything, don’t ask them to share it, don’t ask them to link to you. Nothing. Do that. Do that periodically. Do that every month. Don’t do it with every little single article and over time you will find that some of these people will share this. It may not be today, it may not be next week but they, journalists and magazines and blogs, they want information to share with their clients and their readers. This is how it works. And then they link to you, they link in their terms, they link with the words they want to use. You are not spamming it. It’s their choice and google likes that. Get a lot of links like that. Get them from important websites that google thinks are important, and you my friend will climb up those ratings in google. All those rankings and do it over time. Over a couple of years, you’ll be at shock at how well you can do. Anything that anyone tells you works quicker, won’t work or will get you in trouble. It’s as simple as that. Simple formula, the faster it works the less likely it’ll work, the more likely you’ll get in trouble. It Thursday which means it is time for a podcast for drive time Thursday! This guy has been on everything. He’s professional broadcaster, so unlike a lot of podcasts, unlike like little old me, this guy is a pro. His name is Srini Rao, its Srinivas Rao. His podcast is called Unmistakable Creative. Now very simple, it’s just describe in their description as TED Talks meets Oprah. And it’s very candid chat, it’s not bunch of questions, the guy is a proper interviewer, very confident. He’s like I said, he’s been around for ages. He gets very very interesting talks out of some very very top people. I recommend Shrini Rao. Go listen. I’ll catch you tomorrow.